James Cohan Gallery is pleased to announce their second gallery exhibition by Chinese expatriate artist Yun-Fei Ji, opening February 19 and running through March 27. The exhibition will include new works on paper as well as Ji's artist's book, Migrants from the Three Gorges Dam, recently published by the Library Council of The Museum of Modern Art, NY. Yun-Fei Ji was born and raised in China during the Cultural Revolution. Separated from his parents at the age of two, Ji grew up on a collective farm outside Hangzhou where, in the absence of TV and radio, he was kept entertained by his grandmother's telling of ghost stories and folk tales. 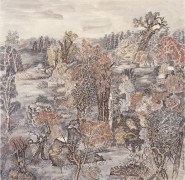 At the Central Academy of Fine Arts, Beijing, Ji studied traditional painting techniques with mineral pigments on mulberry paper in the style of Song Dynasty landscape painting. 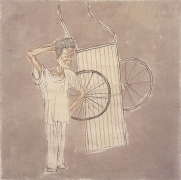 After relocating to the United States in 1986 on a fellowship from Fulbright College at the University of Arkansas, Ji found his voice as an artist who reinvents the system of symbolic structures found in classical Chinese painting to expose the dark side of industrial development on contemporary life. As Ji states, "I use landscape painting to explore the utopian dreams of Chinese history, from exhibitions collectivization to new consumerism." In this new body of work, Ji continues to make reference to the historical in order to connect with the contemporary. Ji revisits the treasure chest of folk legends he grew up with while also exploring classical texts such as Strange Tales from a Chinese Studio, a collection of ghost stories by the 18th century author Pu Songling. Ji's paintings, populated by fantastical creatures, animal spirits and monstrous ghosts, take their inspiration from these tall tales to offer a critique on the fallibility and corruption of Chinese leaders as their subtext. Like in the ancient stories, Ji's ghosts are stand-ins, free to express themselves in ways not allowed to people living under tightly controlled social and political hierarchies. Ji's interest in the French libertarian writer, the Marquis de Sade, has also provided inspiration for his new works. Ji draws parallels between the debauched noblemen in de Sade's tales and the Chinese communist leaders, whose hubris caused them to fall prey to sexual misconduct and other vices while expecting the public to be self sacrificing. In the painting Pleasures of the Party Boss (2009), Ji's use of bamboo in the foreground alludes to its traditional symbolism of purity, humbleness and the upstanding moral qualities that are extolled in Confucius philosophy thus providing a stinging yet subtle contrast to the decadent scene. Also on view is Ji's new artist book, Migrants from The Three Gorges Dam, which is presented in the form of a scroll. This work is another representation of Ji's continuing endeavor to portray the social and psychological upheaval caused by the building and subsequent flooding of the Three Gorges Dam on the Yangtze River in China. This 32-foot long, gradually unfolding narrative tells the story of the tragic effects of the project on those dispossessed by the Dam and the resulting loss of the rich culture from the Three Gorges region. The scroll consists of hand-printed paper mounted on silk that was made with over 500 hand carved, pear wood blocks. 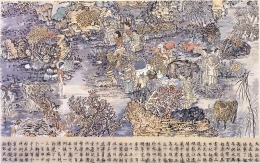 It was printed at the famous Rongbaozhai studio (the 'Studio of Glorious Treasures'), which was once closely associated with Beijing's imperial enclave in the Forbidden City. Rongbaozhai studio still makes prints and scrolls in the style it developed over a thousand years ago and has been declared a "rare intangible cultural property" by the Chinese government. 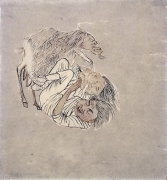 Like Ji's paintings, this edition is populated with naturalistic and symbolic images of places and people, from 'floating weeds,' an ancient Chinese phrase for displaced people to phantasmagoric beasts. At end of the scroll, Ji 's calligraphy tells the long history of Chinese ambitions to tame the Yangtze. Yun-Fei Ji received the 2006 American Academy Prix de Rome fellowship and residency, and, in 2007, was artist-in-residence at Parasol unit foundation for contemporary art London. In 2005, Ji was artist-in-residence at Yale University where he conducted extensive research with the institution's scholars. 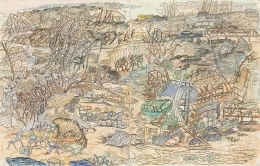 Ji's important solo museum exhibition, The Empty City, 2004, originated at the Contemporary Art Museum (St. Louis) and toured to the Rose Museum, Brandeis University, and the Peeler Art Center, DePauw University. In 2004, the exhibition Yun-Fei Ji: The East Wind was organized at the ICA, University of Pennsylvania. Ji's work has been exhibited in solo and group shows throughout the United States and Europe including the Whitney Biennial 2002. In 2008, Displacement: The Three Gorges Dam and Contemporary Chinese Art, an exhibition of four Chinese artists originated at the Smart Museum of Art, Chicago, IL and continues to tour nationally. Yun-Fei Ji lives and works in Brooklyn, NY.